Gilgit Baltistan is, perhaps, the most spectacular region of Pakistan in terms of its geography and scenic beauty. Here world’s three mightiest mountain ranges: the Karakoram, the Hindu Kush and the Himalayas – meet. The whole of Gilgit Baltistan is like a paradise for mountaineers, trekkers and anglers. The region has a rich cultural heritage and variety of rare fauna and flora. Five out of the fourteen mountain peaks with height of over 8000 meters including the K-2 (world’s second heights peak) and some of the largest glaciers outside polar regions are located in Gilgit Baltistan. 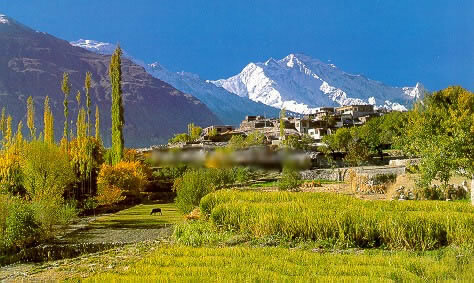 Beautiful landscape, unique cultural heritage and rich biological diversity give Gilgit Baltistan a competitive advantage in attracting tourists from all over the world. This area is Known as Paradise on Earth with large number of tourist destinations and fully accessible VIA Karakorum Silk Route .Famous mountains are Rakaposhi (25,551 ft) “Ghulmet Nagar”, DiranPeak (23,839 ft) “Minapin Nagar”, Golden Peak (23,054 ft) “Hopar Nagar”, Hispar Glacier “Hispar Nagar”, Hunza Peak (20,571 ft) “Karimabad Hunza’, Ladyfinger Peak (19,685 ft) “Karimabad Hunza”, Ultar Sar (24,239 ft),”Karimabad Hunza” Shispare Peak (18,210 ft) “Karimabad Hunza”, Passu Glacier (24,534 ft)”Passu Hunza”.